Short biography: Jonathan Curiel is an award-winning writer and journalist in San Francisco. Long biography: Jonathan Curiel is an award-winning author and journalist who has written widely about Islam, the Middle East, foreign affairs, visual art, film, music, and other subjects – and has done research and reporting from around the United States, and from Mexico, Europe, Japan, Pakistan, the Middle East (Iran, Syria, Lebanon, Jordan, and Egypt), North Africa (Morocco and Algeria), and West Africa. He has interviewed and profiled some of the world’s leading figures in the arts and global affairs, and has also written widely about social issues, race, religion, and politics. In the months after 9/11, Curiel reported for the San Francisco Chronicle from Syria, Lebanon, and Jordan – doing exclusive interviews with Middle East figures, and reporting on Hezbollah, Palestinian refugees, the Syrian government’s war on dissident groups, Beirut’s rebuilding, media coverage of the Middle East, and other subjects. From October of 2005 to April of 2006, Curiel was a Reuters Foundation Fellow at Oxford University in England, where he researched and wrote a 10,000-word paper on the historic impact of Islamic architecture on synagogue and church architecture. The paper featured research and reporting from England and southern France. During the 1993-1994 academic year, Curiel lived in Lahore, Pakistan, where he taught journalism as a Fulbright Scholar at the University of the Punjab. 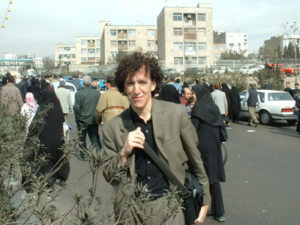 In 2005, Curiel’s work for the San Francisco Chronicle was honored by Columbia University’s Graduate School of Journalism. (Curiel, a staff writer at the Chronicle from April of 1985 to August of 2009, was one of a select number of American journalists – including CBS’s Ed Bradley – cited by Columbia University for doing outstanding articles or programs on race and ethnicity.) Curiel has written freelance stories for the New York Times, Wall Street Journal, Christian Science Monitor, Columbia Journalism Review, American Journalism Review, Salon, GlobalPost (the foreign affairs site), Trouw (a prominent Netherlands newspaper based in Amsterdam, which translated his opinion piece into Dutch), Ode magazine, the Advocate magazine, Tablet (the online magazine devoted to Jewish Life and culture), AramcoWorld (the bimonthly magazine that spotlights the Arab and Muslim world and its connection with the West), Los Angeles Times, Detroit Free Press, Celebrated Living (the American Airlines magazine), the Bay Citizen (the news and culture site that covers the San Francisco Bay Area), and The Wire (a London music magazine). He has also done freelance work for Sight & Sound, TV Guide, Maclean’s magazine (Canada’s equivalent of Time and Newsweek), and True/Slant, where he was a blogger from March of 2009 to July of 2010. Curiel’s articles have been reprinted in such publications as The Globe and Mail (Canada’s national daily newspaper), Chicago Sun-Times, Chicago Tribune, Atlanta Journal-Constitution, Orange County Register, Seattle Post-Intelligencer, Hartford Courant, New York Post and New York Daily News. In the Fall 2009 semester, Curiel was a lecturer at the UCLA Herb Alpert School of Music in Los Angeles, where he taught writing, interviewing, and other journalism practices to undergraduate and graduate students. In February of 2010, he was an O’Donnell Visiting Educator at Whitman College in Walla Walla, Washington, where he gave lectures related to his book Al’ America. In May of 2010, he became art critic for SF Weekly. Also in 2010, Curiel was named a writing consultant for the United Nations Development Programme in New York, an arts blogger for KQED (the main San Francisco affiliate of PBS and NPR), and a journalism juror for World Hunger Year’s annual Harry Chapin Media Awards. In 2013, Curiel was a USC Annenberg / Getty Arts Journalism Program fellow in Los Angeles, and in 2013 and 2014 was named a finalist for a Creative Capital | Andy Warhol Foundation Arts Writers Grant. For his art reviews in SF Weekly, Curiel won second place in the “Opinion/Criticism” category of the 2014 Freelance Journalism Awards, sponsored by the Pacific Media Workers Guild. In 2015, London-based I.B. Tauris published Curiel’s book, Islam in America, which uses interviews, reportage, and journalistic analysis to detail the long history and current status of the religion in the United States. The Oxford Journal of Islamic Studies, published by Oxford University’s Centre for Islamic Studies, called Islam in America “an engaging overview (that) is well written” and “a valuable addition to the available literature on Islam and Muslims in America. . . . The contributions here include an emphasis on early white American converts to Islam and good introductory segments on the Nation of Islam, the Moorish Science Temple, and American Muslim feminists. Curiel also puts race front and centre in many instances, giving valuable references and insights about access to citizenship and relations among Muslims of different backgrounds.” In an interview with Minnesota Public Radio, Jaylani Hussein, executive director of the Minnesota branch of the Council on American-Islamic Relations, said Islam in America was one of five books that people should read to know more about Islam. (The other books were The Story of the Qur’an: Its History and Place in Muslim Life, by Ingrid Mattson; Islam: A Short History, by Karen Armstrong; What Everyone Needs to Know About Islam, by John L. Esposito; and In the Footsteps of the Prophet: Lessons from the Life of Muhammad, by Tariq Ramadan.) Islam in America is in more than 200 libraries around the world, including the libraries of Georgetown University, the National Library of Scotland, University of Cambridge, Trinity College (Dublin), University of Zurich, Bibliothèque nationale de France, King Abdul-Aziz Al Saoud Foundation for Islamic Studies and Human Sciences in Casablanca, the National Library of Israel, and NYU Abu Dhabi.